This will be the final posting in 2016 as I (Bob Jones) will be away until 6 January. The closing date for entries in the Christmas Quiz is 5 January, so be sure to email me your answers by then. Looking back at the Suffolk League in the first half of the 2016/2017 season, it has been heartening to note that there were only four board defaults, one in Division 1 (Bury St Edmunds C) and three in Division 3 (Ipswich E, Ipswich F and Felixstowe B). There have been a few postponed matches, but these appear to have been agreed between the respective teams without any apparent ill-feeling. Two matches which should have been played in the first half are outstanding: Manningtree A v Bury St Edmunds B (to be played on 11 January) and Stowmarket A v Saxmundham A (28 February). Competitions Secretary David Green has experienced very few problems so far this season. One involved both captains agreeing to a result with one game transposed (Player A appearing to play for Team B, and vice versa). But that has now been sorted. David is hoping that the second half will be as peaceful as the first. This is the final part of the Christmas Quiz. It continues to use puzzles taken from Hugh Courtney's Christmas Quizzes in Chess magazine. Today the puzzles are from the 1985 quiz. a) to be in stalemate? b) for White to be able to mate in one? 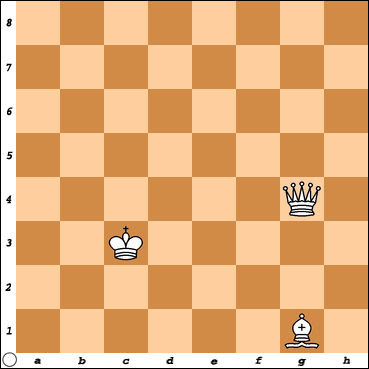 c) so that it can never be mated (assuming the king remains on that same square)? With so few pieces on the board, this one should be easy. But be warned, it's anything but! 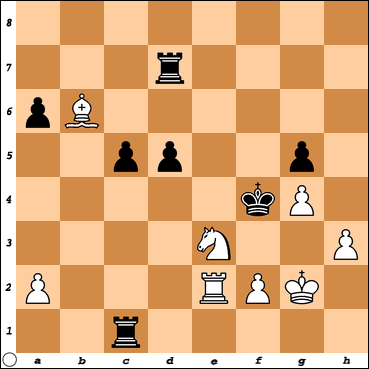 In this position, White takes back his last move and instead plays a move that is instant checkmate. 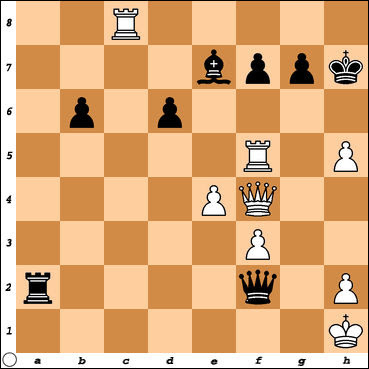 What is the retracted move and what does White play instead? Firstly, Black retracts his last move (a capture). 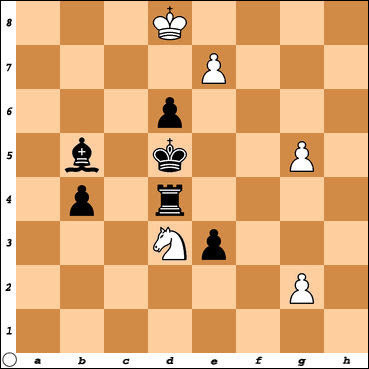 Next, Black plays another move instead to allow White to checkmate in one. What is: a) the retracted move? b) What White piece then emerges on the board? 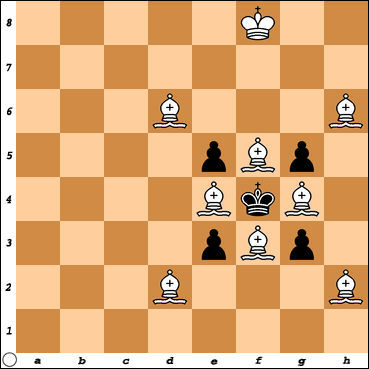 c) What is Black's next 'helpful' move? d) How does White then checkmate? This is the first of three days of Christmas puzzles. Hugh Courtney died in 2012 at the age of 84. Every year up to 2004 he published a Christmas Quiz in Chess magazine. His stated aim was "to astound, puzzle, bemuse, infuriate, delight, amaze and amuse". 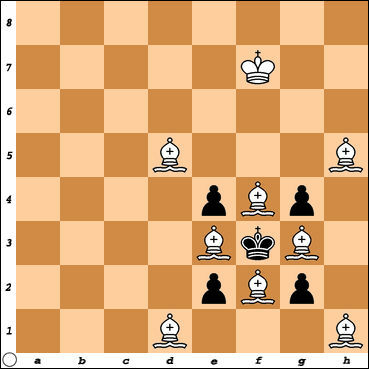 These are both helpmates in two, with Black playing first. White will mate on his second move. 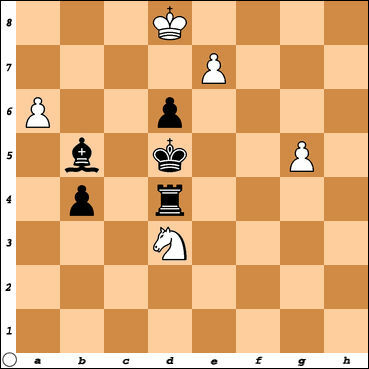 In a helpmate, Black plays moves which assist White. These are quite tricky! Don't put your answesr in the comments below, but wait until Boxing Day and then email me your answers. The best set of answers will win a new chess book. With the matches played yesterday at Bury, the Suffolk League has reached its halfway point. With the exception of a couple of postponed matches, each team has now played all the other teams in their division. In Division 1, Manningtree A top the league, despite having played only five matches. Their outstanding match against Bury St Edmunds B will be played on 11 January. Manningtree A are unbeaten and are half a point clear of second-placed Ipswich C. At the other end of the table, Bury St Edmunds C are half a point clear of bottom team Ipswich B. Bury St Edmunds C is the only team not to have won a match yet. To view the current league table, click here. In Division 2, Bury St Edmunds A are three points clear of the pack, with Felixstowe A in second place. Bottom-placed Stowmarket have a match in hand (against Saxmundham A) but this won't be played until the end of February. Click here for the latest league table. Division 3 is the only division to have completed all their matches. Unbeaten Manningtree A appear to be romping away as they are four points clear of Saxmundham B. Felixstowe B are three points adrift at the foot of the table. Here is the latest league table. The annual Hastings International Chess Congress will be held from 28 December to 5 January. To date, 12 GMs and 11 IMs have entered the Masters section. Local players Adam Taylor and Ed Player have also entered, as well as former Suffolk student IM Justin Tan. You will be able to follow their progress here. 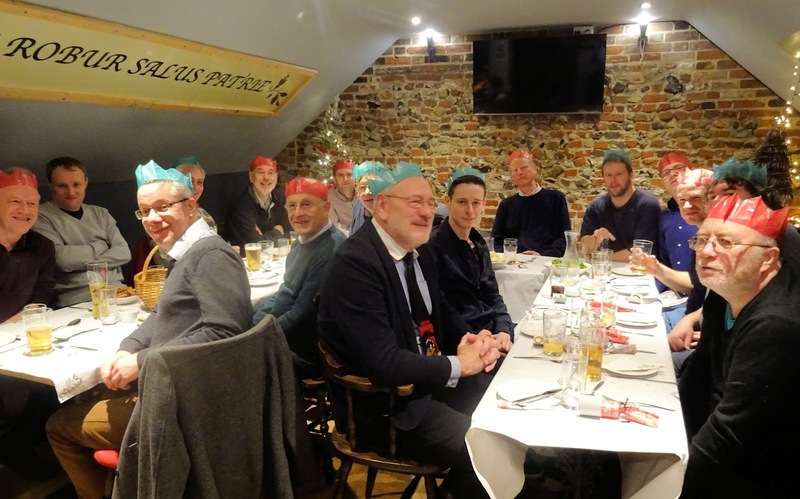 17 members of Bury St Edmunds Chess Club, including several Ipswich players who are also members of the club, met on Monday night at Oakes Barn in Bury for a Christmas meal. The event was organised by John Peters and will almost certainly be repeated next year. Numbers had to be restricted due to the limited space available. After an excellent three-course meal (costing only £12.50 pp), most members stayed on for some Blitz games of chess. 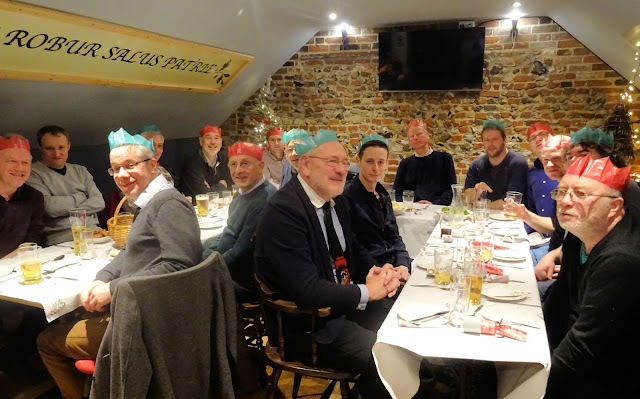 Left to right in the photo are: Graham Moore, Andrew Shephard, Tim Lunn, Michael Clapham, Steve Ruthen, John Feavyour, Mike Harris, Ian Wallis, Laurie Pott, Adam Leigh, Hugo Smith, John Peters, Andrew Donnelly, Ed Player, Jon Collins (hiding), and Steve Gregory. 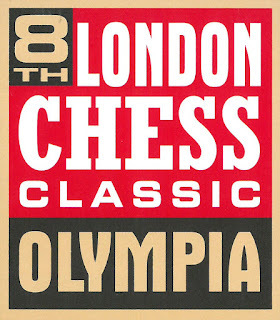 The London Chess Conference took place at the Hilton Olympia from 10 - 12 December and was timed to coincide with the start of the 8th London Chess Classic. There's an article here about it, by one of the presenters, Sean Marsh. The official website is here. The topic of the Conference was 'The Didactics of Chess'. To save you looking it up, 'didactics' means 'the science, art, or practice of teaching'. So the Conference focused on different ways of teaching chess, mainly to children. Speakers from around the World included Malcolm Pein (Chess in Schools and Communities), Mike Basman (ex-UK Schools Chess Challenge) and Kevin O'Connell (formerly from Ipswich). It would be useful if the speakers' papers could be published, but there's no word on that yet. An article in The Times today - here - explains why Lord Price, former chairman of the John Lewis Partnership, believes that children should start playing chess. Meanwhile, yesterday's Telegraph reports that 'MPs call for chess to be redefined as a mindsport'. Perhaps this is a better line to follow than wanting chess to be declared a 'sport'. The lack of physical effort needed will always preclude it from becoming a 'sport'. 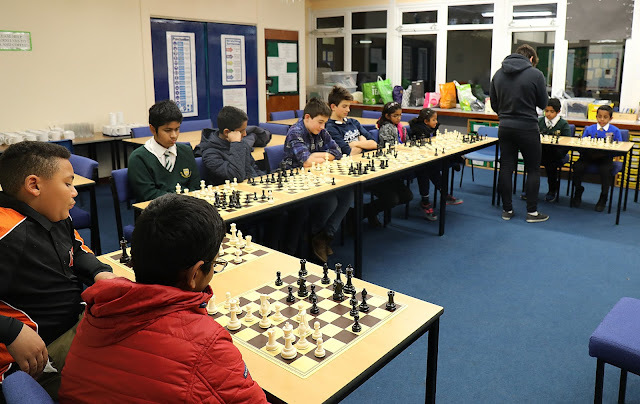 The first age-groups (Under 10s and Under 14s) played this weekend in the London Junior Championships. The remaining age-groups (Under 8, 12, 16, 18) play in the week after Christmas. Six children from Bury Knights JCC competed in these events. In each age-group there are two sections: Minor and Major. To qualify for the Under 10 Major section, players had to score at least 4½/6 in a qualifying tournament. The only Suffolk entrant in the Under 10 Major section was seven-year old Rowan Kent, who attends Woodbridge School and is also a member of the Bury Knights. Rowan scored 2/7, but has another two years in the same section. After Christmas he will play in the Under 8 section, where he should stand a much better chance of a good score. There were two local entrants in the Under 10 Minor section: Amy John and Toby Martin. Amy, who is only eight years old, scored 4/7. She won her first three games but then faced the top seed in Round 4. Toby scored 3½/7. In the Under 14 section there is no qualifying requirement. Entrants are divided into Major and Minor sections according to grade, with the Minor section only open to players graded 120 or below. 12-year old Tom Roy, graded 91, had an excellent tournament, scoring 4½/6 to finish in joint third place in the Minor section. He will have two more years to play in the Under 14s, so should be able to move up to the Major section next year. Adam John, still only 10 years old and graded 129, played in the Under 14 Major section. He scored an excellent 3½/6. After Christmas he will play in the Under 12 Major. His brother Alan was unable to complete the tournament and withdrew today. 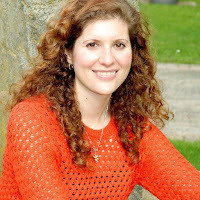 There's a good article by Sabrina Chevannes in Chessbase News here. It includes details about the recent House of Lords versus House of Commons match, which was reintroduced this year after a lengthy break of seventeen years. The nine-round FIDE Open ended this evening. Joint winners were two French GMs, Etienne Bacrot and Sebastien Maze, who both scored 7½/9. There were a further seven players, all GMs, on 7 points. Early leader, 17-year old Indian GM Aravindh, faded towards the end to finish on 6½ points. Local players Ed Player and Adam Taylor both scored 5 points. Adam should gain some rating points, but Ed might lose a few. The Chess Grand Tour has reached Round 7 (out of nine). Current leader is Wesley So, the latest GM to attain the 2800 rating level. He is on five points, closely followed by Fabiano Caruana on 4½ points. The only English player in the event, Michael Adams, is on three points. The photo above shows the stage and auditorium at the Olympia Conference Centre where the tournament is being held. In a busy evening at the Bury St Edmunds club, there were four matches being played. There should've been five, but Linton couldn't field a team so the fifth match had to be postponed. Chris played the tempting d4, attacking the knight, only to be hit with Nd5+! 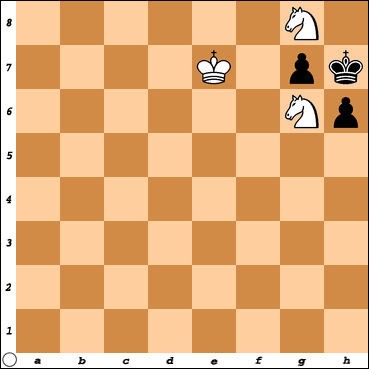 The rook must take the knight, when Bc7+ is mate in two. The seventh round of the FIDE Open took place this afternoon. Ed Player took a half-point bye to move his score on to 4/7. Adam Taylor faced his third GM of the tournament (Peter Wells) but was unable to improve on his previous results against GMs. Adam had a half-point bye in Round 1, and has since won three games against lower-rated opponents. He is yet to play anyone rated within 170 points of him, either higher or lower. The sole leader is Indian GM Aravindh, on 6½/7, with two further GMs close behind on 6 points. 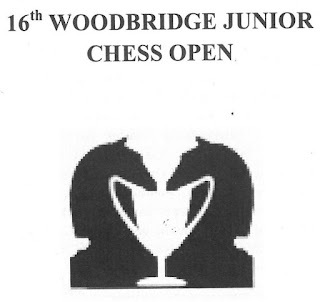 This weekend, the London Junior Chess Championships take place, with the Under 10s and Under 14s competing. After Christmas, the Under 8s, Under 12s, Under 16s and 18s will be playing. 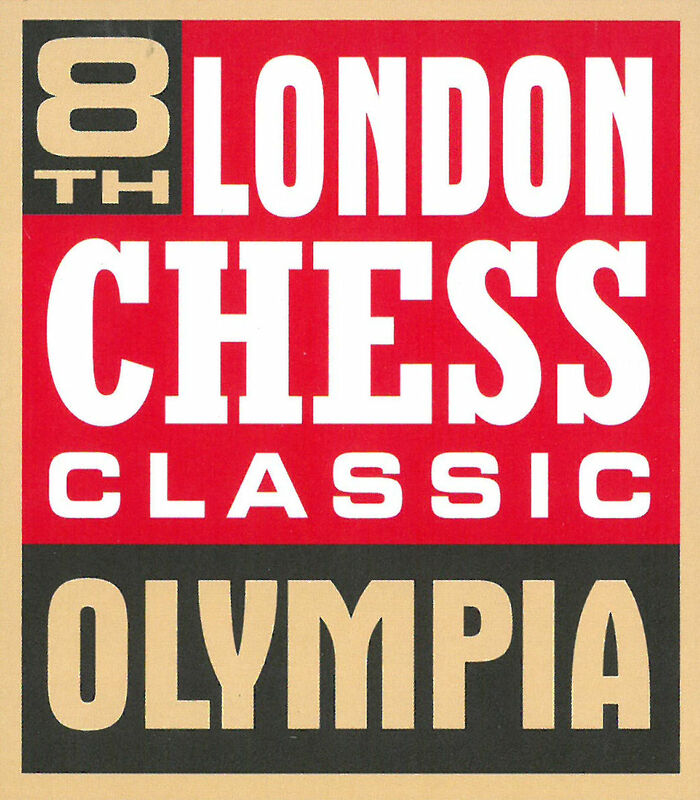 The London Junior Chess Championships originated in 1924 as the London Boys Championship. Several Suffolk players have qualified to play, including the three John children, Alan, Adam and Amy, from Bury St Edmunds. Suffolk League's Division 1 currently looks a bit distorted, with some teams having played two matches more than others. Joint leaders are two Ipswich teams, C and A, on 12½ points. However, Ipswich C have only played five matches, to Ipswich A's six. Not far behind are Manningtree A, unbeaten this season but have only played four matches, with 10½ points. At the other end of the table, Bury St Edmunds C recorded their first result last week, drawing against Ipswich A. However, they remain in last place on 7 points. At this stage of the season, it looks as if almost any team could win the title. Shaun Munson (Ipswich A) is leading the individual listing, with an unbeaten 5/6. Close behind are Ted Matthewson (Ipswich C) and Nick Savage (Ipswich A) on 4/5. After four rounds of the FIDE Open, the two local players, Adam Taylor (Manningtree) and Ed Player (Bury St Edmunds) are both on 2½ points. 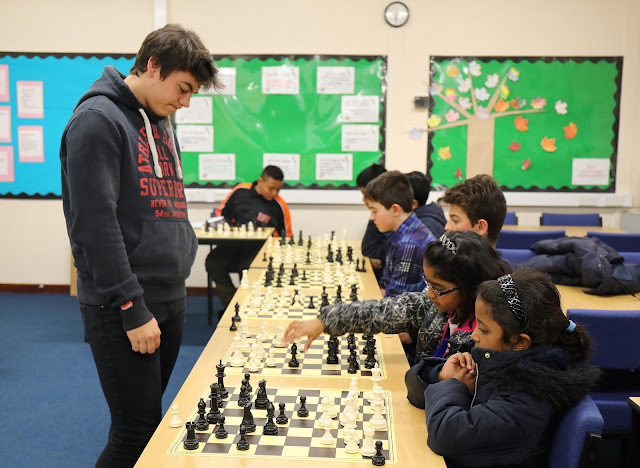 Adam had a half-point bye in Round 1 and today beat Sarah Longson, the new organiser of the Delancey UK Schools Challenge. Only three GMs are on maximum points: GMs Shabalov, Aravindh and Bogner. All three have Elo ratings that are within three points of each other (2563/2564/2566). See the latest standings here. Of the anticipated 250 entrants, 243 are playing, with seven 'no-shows'. Of the three divisions in the Suffolk League, only Division 3 is making much sense. Whilst teams in Divisions 1 and 2 have played different numbers of matches (between four and six each), all eight teams in Division 3 have played six matches, making it easier to see how things are panning out. In a clear lead is Manningtree B, who were relegated last season from Division 2. They have 18½ points, 3½ points clear of the two Saxmundham teams (B & C) who are in joint second place. At the other end of the table, Felixstowe B are 2½ points adrift, with Ipswich E above them in seventh place. Unsurprisingly, players from Manningtree and Saxmundham lead the individual table, with Adrian Sanderson (Manningtree) leading on 5/5. Close behind is Mike Usher (Saxmundham) with 5/6. 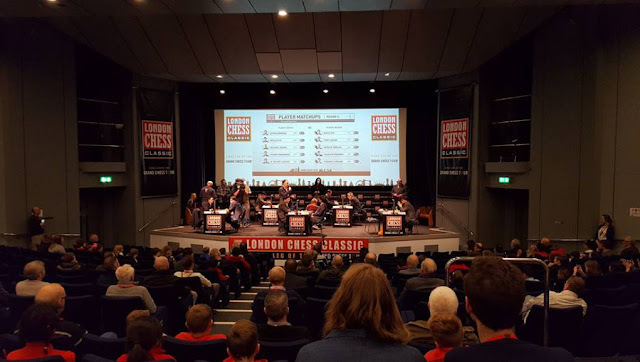 The London Chess Classic started today and continues until 18 December. In the Grand Tour, England's only entrant, Michael Adams, lost to Lev Aronian in the first round. In the FIDE Open, which features 34 GMs and 24 IMs amongst the 250 entrants, Ed Player won his first round against a lower-rated opponent. Ed will gain just 1½ rating points from this victory, taking him to 2240 in the live Elo ratings. Adam Taylor took a first round bye. 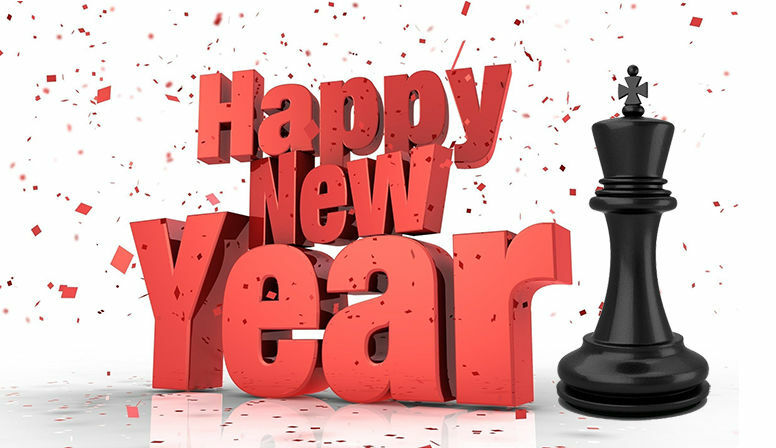 "Chess, like science, is the kiss of death for optimists. 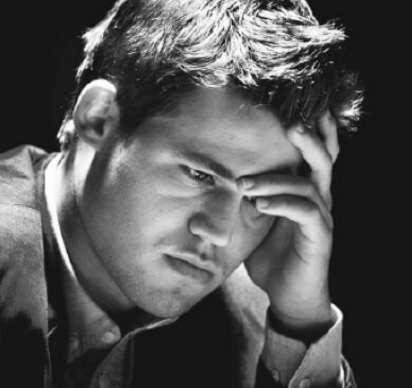 Only the most naïve rookie feels optimistic in Chess. Instead, Chess players think about their doom. In a study called "Chess Masters' Hypothesis Testing", Michelle Cowley and Ruth Byrne of Trinity College, University of Dublin, set out to put that to the test with actual chess players and the falsification idea held up. The best chess players, they found, used falsification to determine their future moves. Bad chess players thought about the counter-moves of opponents in a very positive light (i.e. 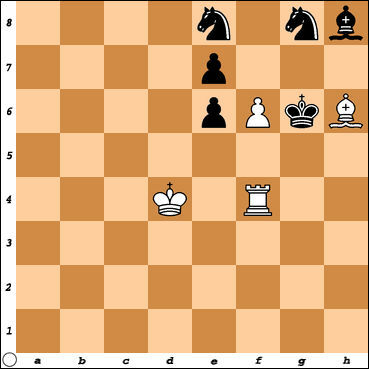 the opponent will do exactly what is needed in order to lose) while the best chess players thought about what opponents' counter-moves would damage them the most if they enacted a strategy; they falsified their own hypotheses. So it isn't just scientists who regularly use falsification, but also chess players." The ECF is organising a weekend course for potential arbiters on 21/22 January. It will take place in Solihull, West Midlands. The course fee is £30 and the lecturers are the two Alex's - McFarlane and Holowczak. If anyone is interested in joining this course, they should follow the links here. There's a new documentary film on the life of World Chess Champion Magnus Carlsen whichgoes on general release this month. It has the original title of 'Magnus' (U). It is very unlikely to be shown in many mainstream cinemas. So you may be unaware that it is being shown at the Ipswich Film Theatre (the Corn Exchange) next week (13, 14 & 15 December, evenings at 7.30 pm). There's an extra afternoon performance (2.30 pm) on Thursday 15th. It costs £7.50 for a ticket, or just £3.00 for under 25s. You can book tickets online. 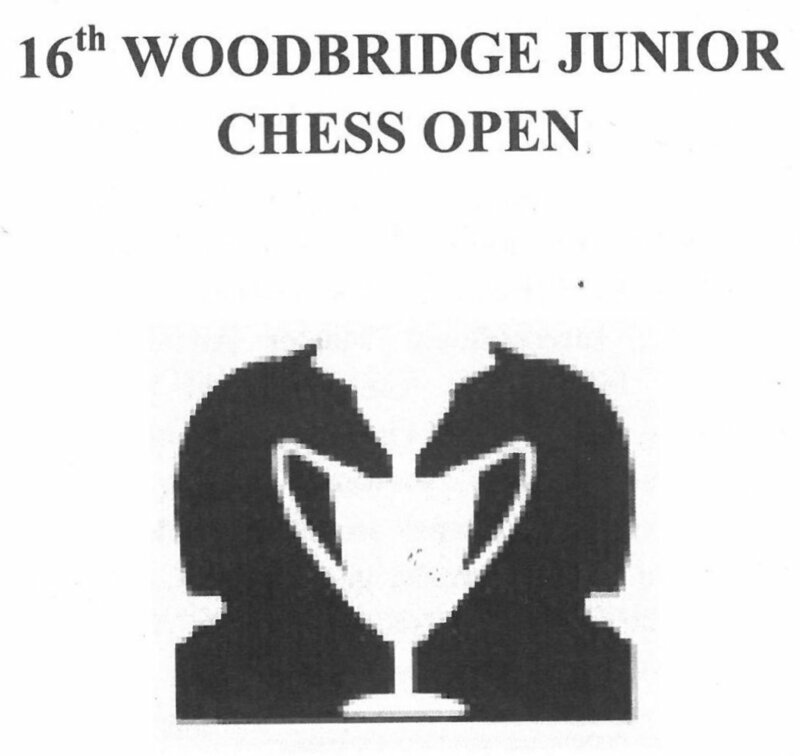 The Woodbridge Junior Open tournament took place last Sunday, with 77 players entered across five age-group sections. There were strong entries from Norfolk and Cambridgeshire, with Suffolk being largely represented by players from Bury Knights JCC and Woodbridge School. This event was also a qualifying tournament for the London Junior Championships, which is one of the most prestigious junior tournaments in the country and takes place later this month. Scores of 4 points were required to reach the Under 8 Final, whilst 4½ points was needed for the Under 10 and Under 12 Major Finals. A lower score of 3½ points qualified players for the Minor Finals in these age-groups. No qualifying score was required for the older age-groups. Last Wednesday, the final day of the World Championship, IM Jovanka Houska gave an interview on the BBC Radio 4 Today programme, which is well worth a listen if you missed it. You can listen to it here. You will need to run the slider to 1:41:30, which is when the interview is about to start. 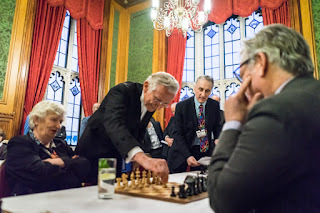 As reported here, the London Chess Classic commences next Friday, 9 December. It continues until Sunday 18 December. Local interest includes Ed Player (2239) and Adam Taylor (2212) in the FIDE Open, where 37 Grandmasters are included among the 250 entrants. They play nine rounds between 9 and 16 December. The Super Rapidplay, with 10 rounds over the second weekend, 17/18 December, features 40 GMs and 363 entrants, so far. Entries are still being accepted for this event, which is free to enter if done by 16 December. 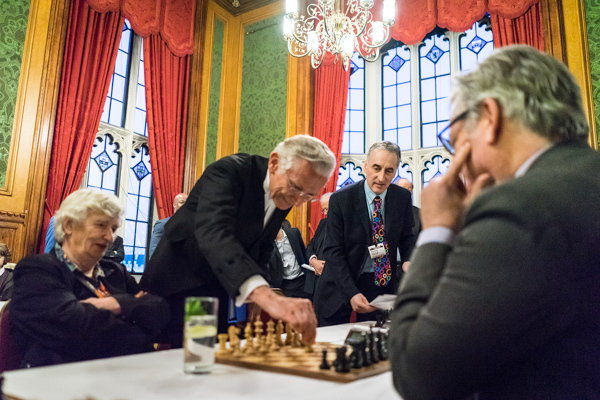 Of course, the main event is the fourth and final round of the Grand Chess Tour, which features eight of the World's strongest players (plus two other invitees, including England's Michael Adams). This event is currently led by GM Wesley So, who looks to have an unassailable lead in the battle for the $120,000 first prize. 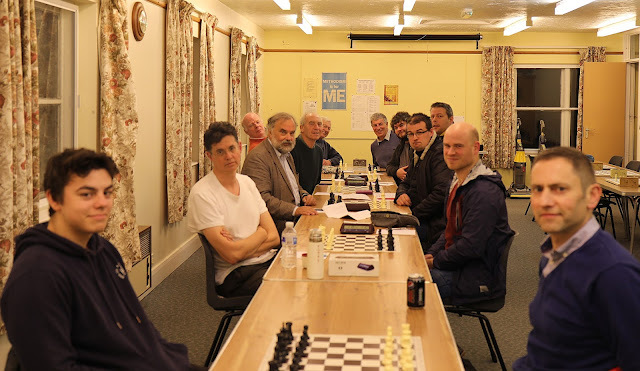 FM Adam Taylor came to Bury St Edmunds this evening to give a Simul against ten of the best Bury Knights members. His opponents' grades ranged from 129 down to 16. They were no match for Adam, who swept them all aside within an hour and a quarter. He then proceeded to run through one of the games (against Jaden Jermy), which proved very instructive. Before the event started, Adam pointed out that his ECF grade, now over 200, was below 100 seven years ago, when he was 11 years old. Several of his opponents today are younger than that, so they were able to see that anything is possible. In the photo above, the ten opponents are (clockwise around the boards): Adam John, Jaden Jermy, Alan John, Ralph Martin, Aaron Saenz, Mario Saenz, Amy John, Tia Martin, Tom Roy and Toby Martin. Entering this annual competition for the first time, Manningtree Chess Club last evening achieved a notable draw against current Norfolk & Suffolk Cup Champions Bury St Edmunds. Fielding a slightly weakened team, Bury lost on the bottom two boards, but won on Boards 3 and 4. The top two boards finished in draws. Whilst the match was in progress, several players could be seen sneaking off to check on the progress of the final day of the World Chess Championship, taking place in New York. As most readers will be aware, Magnus Carlsen succeeded in retaining his title by beating Sergey Karjakin 3 - 1 in the Rapidplay tie-breaks. Carlsen won the final game in style. 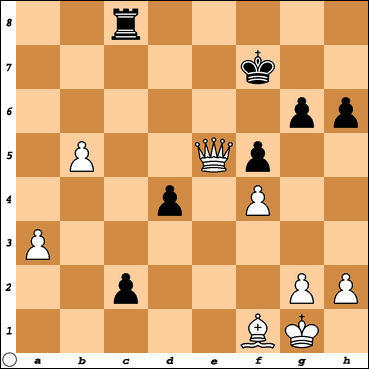 From the position below, when Karjakin (Black) had three ways of checkmating White in one move, Carlsen played Qh6+!, forcing mate on his next move. Karjakin resigned on the spot.